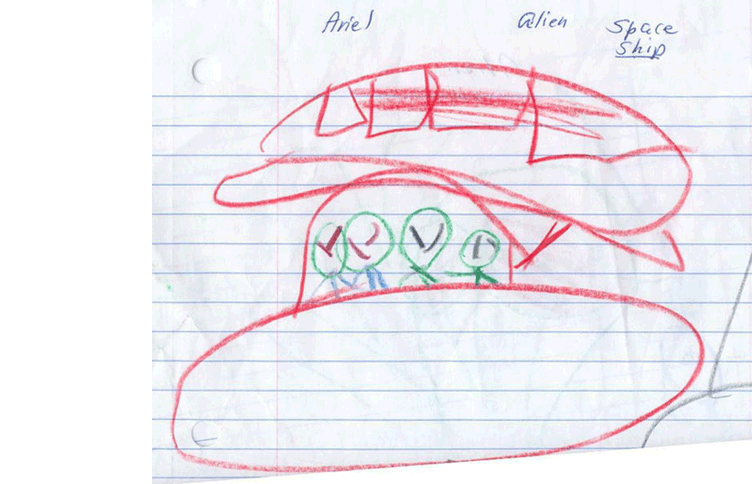 Children's drawings of Alien encounters and how they relate to Autism. The autism epidemic and alien abductions may be connected. I came to that conclusion after working with abducted parents and their abducted children for twelve years. Many parents who were abducted had autistic children. This website shows drawings made by children who were abducted and connects the cause of the autism epidemic to aliens from space. When autistic children wear a thought screen helmet or neuro hat every day, they remember their abduction experiences and their behavior improves. The children who made these drawings were declared hopeless autistics in 2000. They wore their helmets every night for ten years, up to 2010. Now, 2018, they are both college students. Thought screens have a healing effect and may help autistic children. See my medical hat site, neurohat.org. Please contact this website if your child makes drawings similar to those shown. Such drawings may provide indirect evidence of aliens abducting children and of the cause of the autism epidemic. There is no malicious software, spyware, spam, virus, or any other destructive software on this site. I downloaded this video myself from the Seattle NBC KING TV Evening show in November, 2005. It is totally clean and has no bad software. It was produced by Saint Bryan of KING TV 5 in Seattle, Washington and KXAS TV in Dallas, Texas. It is the best alien abduction video on the internet and was on television three times. The second video was made by a bay mounted camera on the space shuttle and was obtained by the Freedom of Information Act. It shows alien space craft in a thunder storm over Florida. Look and listen to the video as I tell you how to get the same video from NASA for free so you can see and check its authenticity for yourself. Please see Michael Menkin's other website, stopabductions.com for instructions on making a "thought screen helmet." It is a non-profit, public service website. Nothing is for sale.